Science has always been something my family has enjoyed. However for so many of my homeschool friends this area scares them to death! I always enjoyed science as a child and have made it a point to try to have fun with my kids learning it too. For the last several weeks my family has had the privilege to review Supercharged Science. I was given the e-Science Premium Membership Plan (K-12 Level Plan) for 6 months and it costs $57 per month. 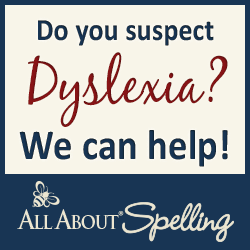 There is another option depending on your ages K-8 for $37 per month. Supercharges Science was started by Aurora Lipper a real life rocket scientist!! My kids thought this fact was simply COOL! She started the site 10 years ago hopeful that she could help science not be boring to children! With the e-Science Premium Membership we had access to over 20 units of study, such as, Energy, Mechanics, Earth Science, Chemistry, and Biology and the parent resources necessary. You have science fair projects and some interesting lessons in math but that's not all over 800 experiments too! There are hours of videos to support the lessons and experiments and a forum for discussion of course regarding the materials. You choose a lesson and it includes the overview to the unit, several lessons for the unit, experiments and videos on the topic chosen. A shopping list is available for each lesson so you can purchase items if needed ahead of time and makes planning easy! Lessons are available for download for people like me who like to read aloud most things to all 3 of my children at once. 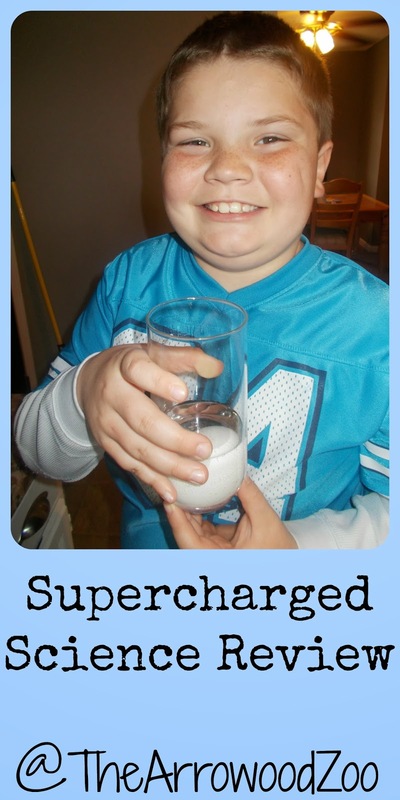 Supercharges Science can be used as a whole curriculum. You could work your way through the entire grade for a well-rounded study or you could do like my family and just supplement. How did we use Supercharged Science? My family used Supercharged Science as a supplement. I would highly recommend the "Getting Started" section. 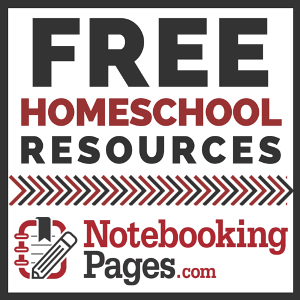 This is very helpful for you to become familiar with everything on the site. My guys are 13, 10 & 9. Once I had looked around a while we decided that we would try to do a lesson on something each week and a project. My kids loved the hands on approach which is something we use normally in our science endeavors. By far their favorite was the Rubber Eggs or Bouncing Eggs! This year we are studying Chemistry so I based almost all our topics from Supercharged on that. Rubber Eggs was something we had never seen before or heard of so it seemed to have a fun element involved right away! Calcium is a mineral in bones and eggshells that makes them hard, so when we put the chicken bone and eggs into the vinegar it started causing the calcium to react by having it weaken the structure. We learned that our bones and teeth contained 99% of the calcium in our body. Soaking chicken bones in vinegar explained how as people get older and lose more calcium than they can replace the bones will become brittle and easier to break. Which was a great time to tell them calcium can be replaced more quickly in people that exercise and eat good foods. 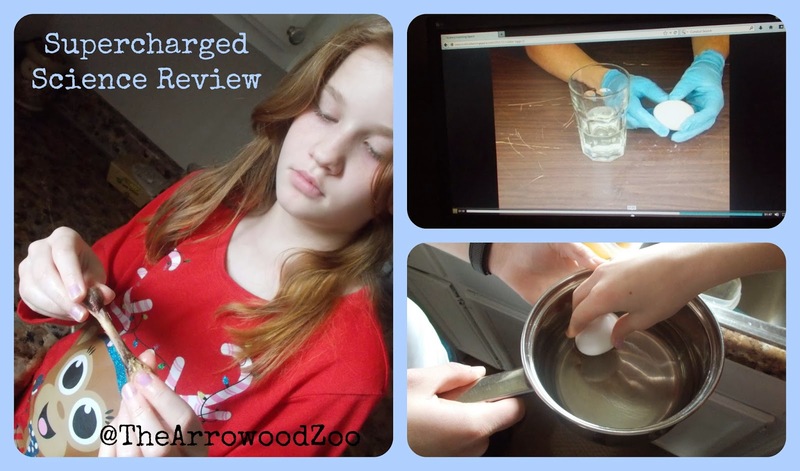 We read several articles about calcium and watched the experiment video until it showed the results, and then we paused it and completed everything that Aurora had said the experiment needed. Once we had completed the steps to start the project we watched the rest of our video. 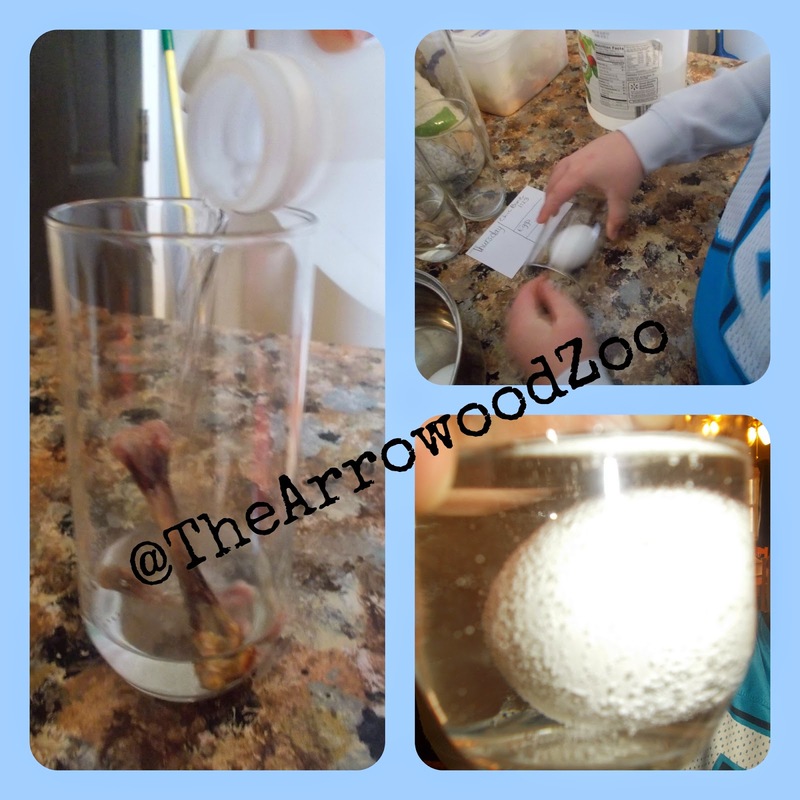 We could see quickly that the vinegar was attacking the eggshell by all the bubbles that formed on the shell. We left the eggs and chicken bone to soak for 2 days and then we examined our final result. 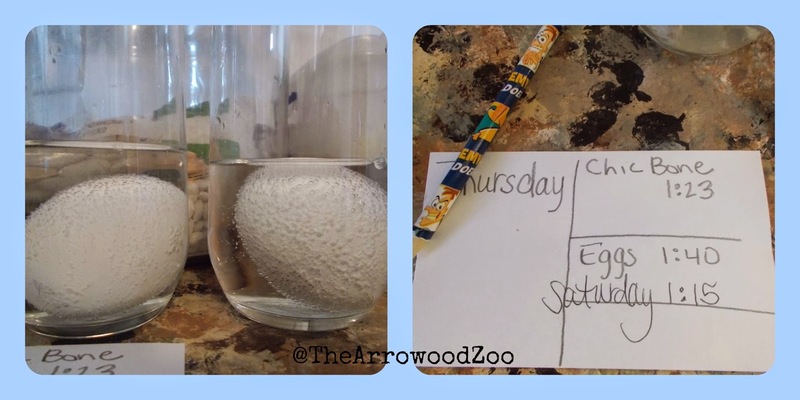 There were some student worksheets and exercises that I downloaded and it was helpful to ask the kids about what happened during the experiment and examine why these things happened. Personally as a parent I thought the program was awesome! It has been well developed and arranged. The experiments are something that my children loved. My kids are very hands on learners and she has totally catered to that aspect of science! One week we actually didn't do a lesson and just played with the tons of experiments that is listed on her site. I personally think the price is a little high and I don't know that I could do that year round the way we school but it is great fun for what you could afford. The only thing I had to watch while using Supercharged Science and this was no issue of Supercharged Science but a personal issue using the program, I have a data allowance and I had to watch carefully what we watched and downloaded to ensure that I didn't go over our data usage plan. That is why the downloadable sheets and plans where perfect for our family. 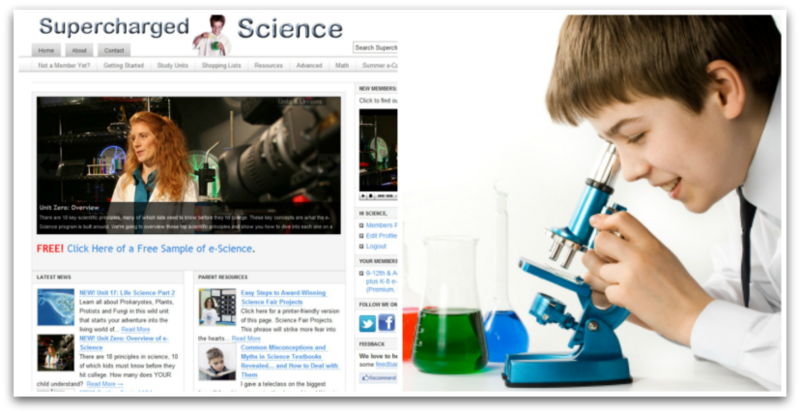 Check out a free copy of the science activity video series and guidebook. Limited time only full access to e-science for just $1.